A brace of brilliant finishes from top scorer Charlie Moone earned a hard fought victory for Hampton on their second trip to Essex in a fortnight. With Hampton finally out of both the FA Cup and Trophy, attention at last returned to a league campaign that has been very disjointed due to knockout commitments. Good recent performances have not yielded the deserved results, but all that was finally laid to rest at Billericay, as Charlie Moone lifted his tally for the season to nineteen in all competitions with a brace of virtually identical goals. In a rare turn of events, Hampton started with the same eleven that played so well, and lost so undeservedly, at Basingstoke last week in the Trophy. And the unchanged side certainly settled quicker than their hosts, with a blocked effort from Moone in the opening minute. Joe Turner then lashed a shot wide after turning well. The Beavers didn’t have to wait long for their breakthrough, though, as on the quarter hour Charlie Moone latched onto a through ball and scored with an instant deft left foot finish which nestled in the far corner. It was a great goal, taken expertly from an acute angle. The first shot from Billericay came from Glenn Poole, but the midfielder’s effort was tame and saved easily by Rodney Chiweshe. 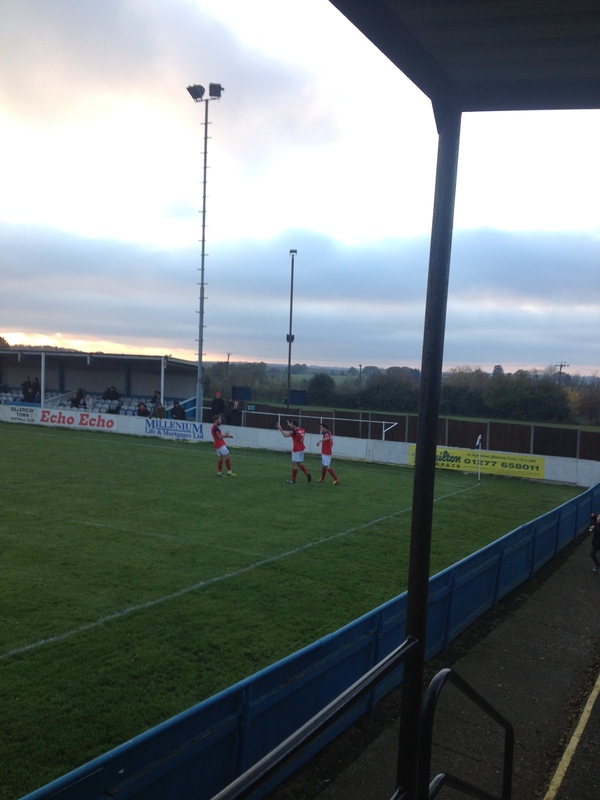 At the other end, Stuart Lake headed over from a James Simmonds corner at the near post. Tommy Brewer had to come off after twenty five minutes with a knock to his foot, a change which saw Karle Carder come into midfield and Joe Turner switch to right back. The enforced change didn’t change the balance of play, and just past the half hour Dan Thompson hit a sweet right foot shot across goal which Billy Lumley did well to tip away at full stretch. From the resulting corner, Tom Hickey’s shot took a clear deflection as it looped over, but the referee saw fit to give a goal kick. It wasn’t the worst decision he made, I can tell you! The second half got underway, and Hampton were attacking the half of the pitch that resembled a ploughed field. Eleven minutes into the half, a short pass from Turner sold Tom Hickey a bit short, and the midfielder flew into a tackle that resulted in a straight red card for the young player. Debate raged among the away fans as to the validity of the sending off (in my opinion, it was probably the right decision. Sorry Tom!). However, just four minutes later, Callum Dunne went in hard and late on Charlie Moone. The foul was at least as bad as Hickey’s, but the referee deemed it only worthy of a yellow card. This sent the away fans (including me!) apoplectic at the ineptitude of the decision. However, the injustice of the decision seemed to galavnise the team, and they continued to be the better side even with ten men. From the freekick for the challenge on Moone, Stuart Lake headed goalwards, but was denied by a fumbling save from Lumley. Lake and Thompson then had shots on target, before Simmonds curled a freekick over after he himself was tripped on the edge of the box. Into the final seven minutes, and Charlie Moone had a shot well saved, before Carder put the rebound across goal and wide. Moone then dragged a shot wide, before the decisive breakthrough came in the final minute. Chasing a ball through, he took a touch which tempted Lumley off his line. As with the first goal, Moone slipped the ball past him with his left foot, and it seemed to take an age for the ball to nestle into the far corner of the net. But nestle it did, and the away fans celebrated as if we had just won the league, the relief at recent poor results being put behind us clear to see. The mobbed celebrations amongst the players told you just how much it meant to the team too. In injury time, Chiweshe pulled out his customary world class save to maintain the lead, and the referee made his best decision of the game by blowing for full time. This result could really now spur the team on to a good run, and lift themselves up the table. Man of the match for me has to be Charlie Moone, not only for his quality finishes that earned the points. His all-round play upfront was excellent, and he fully deserves the plaudits. James Simmonds ran him close, putting in a stellar performance in midfield. Everything went through him, and he really looks on top of his game at the moment. Hampton: Chiweshe, Brewer (Carder 25), Wells, Lake, Powell, Roberts, Turner, Hickey, Thompson (Aite-Ouakrim 74), Simmonds (c) (Jeffreys 75). Unused subs: Halliday, Wanadio. 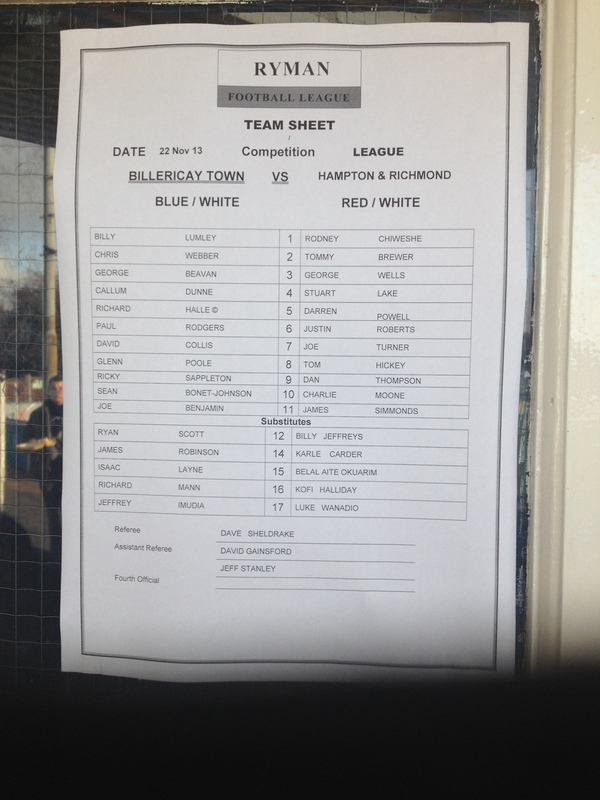 Posted on November 24, 2013, in UTL Archive and tagged Charlie Moone, Darren Powell, Hampton & Richmond Borough, Isthmian League, James Simmonds, Paul Barry, Rodney Chiweshe, Ryman Premier. Bookmark the permalink. Leave a comment.